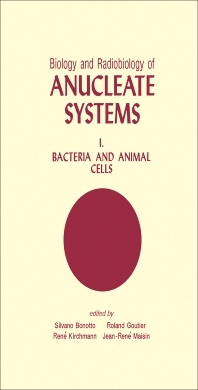 Biology and Radiobiology of Anucleate Systems, I. Bacteria and Animal Cells documents the proceedings of the three-day symposium on Biology and Radiobiology of Anucleate Systems held in Mol, Belgium on June 21-23, 1971. This compilation mainly focuses on the anucleate systems, but some papers dealing with the function of membrane-bound polyribosomes and behavior of isolated cellular organelles are also included. The topics discussed include morphogenesis and synthesis of macromolecules in the absence of the nucleus; production of DNA-less bacteria; and modifications of radiosensitivity in nucleate and anucleate amoeba fragments. The heterogeneity of membrane-bound polyribosomes of mouse myeloma cells in tissue culture; squid giant axon; and cytoplasmic damage leading to delay of oral regeneration in Stentor coeruleus are also elaborated. This book likewise covers the regulation of protein synthesis in anucleate frog oocytes and DNA, RNA, and protein synthesis in anucleate fragments of sea urchin eggs. This publication is a good reference for students and researchers intending to acquire knowledge of the normal and irradiated cell and subtle relations between its nucleus and cytoplasm.